See it if You are into a whole new experience (I am talking about the Yiddish version of DOS). It brought fresh and poignant perspective. 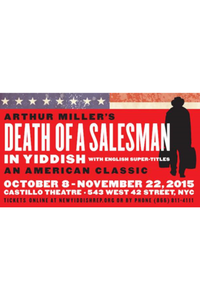 Don't see it if You are not up for a play performed in Yiddish with supertitles. See it if you love a classic. Don't see it if you don't enjoy a good play. See it if You liked the original and you like character development more than plot. See it if it ever returns. Don't see it if You are reluctant to cry in a theater. See it if After reading this in high school I HAD to see this. Great choice. See it if You appreciate a great American story. Don't see it if You hate crying. See it if You enjoy thought provoking theatre. Don't see it if You are looking for a feel good piece.